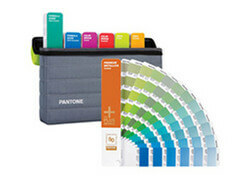 PANTONE Plus Series Solid Guide Set, is a specially bundled collection of four reference guides which offers the complete array of PANTONE solid colours making it a definitive resource for graphic design, print and colour professionals. 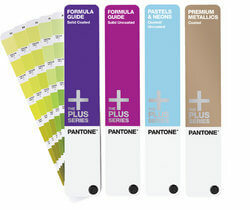 PANTONE Plus Series Solid Guide Set presents 1,341 contemporary solid colours, 300 shimmering metallics, 154 soothing pastel hues and 56 hot new neons. 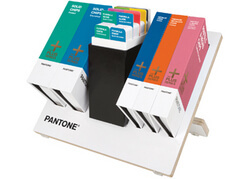 All four guides are presented as chromatic, easy-to-use fan books on both coated and uncoated stocks and offer the definitive way to accurately select, specify and communicate solid PANTONE colours. 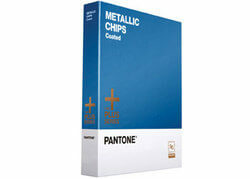 PANTONE Plus Series Premium Metallics (Coated) – 300 shimmering shades to add real sizzle to your design projects!